There are still sections of the German autobahn that have no posted speed limit which means you can drive as fast as you want; 120mph, 130mph even 150mph. However, because of posted speed limits, autobahn repair/construction and the volume of traffic itself, there are very limited opportunities to drive at those kinds of speeds. 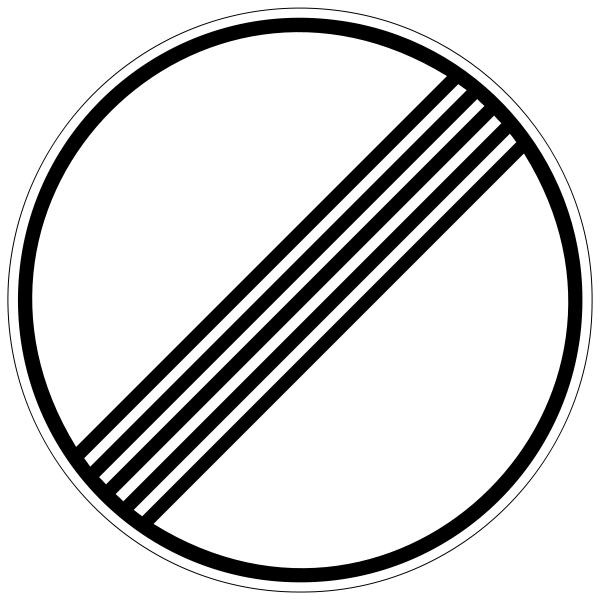 Posted speed limits are the biggest buzz kill as far as driving fast on the autobahn. The recommended speed limit even when none is posted is 130 kph (82 mph). But a posted limit of 130 kph is now very common. 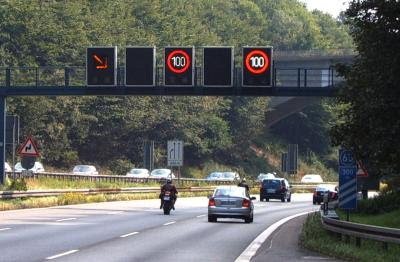 Now, if there’s a curve, a steep hill, an on ramp, autobahn junction, rough road or a bridge, there can be posted speed limits down to 100 or 80 kph and in some extreme cases, 60 kph (37 mph). 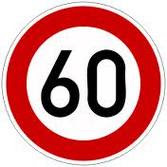 If you see this 60 kph sign to the right, you're in for some really slow autobahn driving. 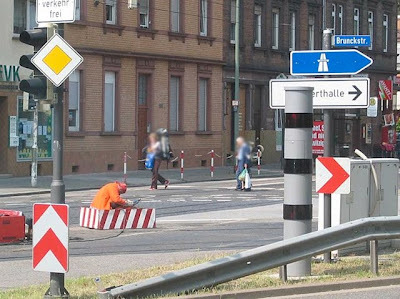 The Germans take great pride in the quality of their autobahn and, as a result, road repairs are a common issue here in Deutschland. On a recent trip back from Munich, a 250 mile drive, we encountered ten repair/construction projects that slowed the traffic to 60 – 80 kph. One, at the junction of the A-7 and the A-6 just east of Heilbronn, where three lanes went down to just one, resulted in a one hour delay. Of course, on any road, including high speed autobahns there are places that increase the risk of an accident; curves, hills, rough roads, junctions, merging lanes and areas of high winds. Other than the rough roads there are plenty of all these issues in Germany and the authorities have become very serious about reducing autobahn speeds in these areas. Because of that it’s very typical to see no posted speed become a posted 130, then 100, then 120, then no posted speed, then 100 and then 120, all within just a few kilometers. Very high Talbrucken (valley bridges) are common in Germany and with them, quite often, soaring winds occur, so a posted speed of 100 kph is typical. Germany is right in the middle of Europe and so there’s traffic from all parts of the continent driving to and through. There are big, long haul trucks from Norway to Portugal, Great Britain to Russia. Cars are small here but there are a lot of them. Natural traffic congestion areas even result in posted signs that warn of a Stau (traffic jam) and when you see one, plan on slowing down, maybe even coming to a stop. Even in the areas where there are no posted speed limits, slower cars or trucks passing even slower vehicles crowd the autobahns. So you might just get up to speed, 120mph, only to very quickly slow down for traffic. This is the sign you want to see on the autobahn. No speed limit. Go as fast as you want. The autobahn can still be fun when you’re lucky enough to hit a long, open stretch of road with no posted speed limit. The best possibility of that is a Sunday, when those long haul trucks are not allowed on the autobahn unless they’ve paid a high price for a permit which very, very few of them do. But, if you’re making a trip of a couple hundred miles, there’s going to be points of frustration and delay, it’s just a matter of how much and when. You run into some interesting things on the autobahn that result in a stau. The video below is what happened to us recently on Veterans Day just outside Ramstein Air Base. The cause of this very slow, moving stau? An unannounced visit by the 1st Lady, Michelle Obama to Ramstein. During her short stay she traveled from Ramstein, across the the A-6, which is the autobahn in the video, to Landstuhl Hospital to visit some of our wounded troops. 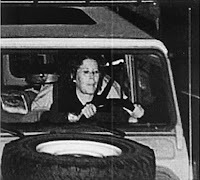 The German police shut down all access to the area around the autobahn where her motorcade crossed under the A-6. We’ve been here, driving in Germany, just over three months and, to this point, we’ve received three speeding notices. I’ve gotten two, a 56 kph in a 50, and a 130 kph in a 120. Jeff got one for doing 60 kph in a 50. Translating kilometers per hour to miles per hour, my tickets were for exceeding the speed limit by 4 mph and 6 mph respectively. Jeff’s was also for exceeding the speed limit by just 6 mph. Really nothing all that excessive and maybe that’s why all three of our notifications were warnings rather than actual, much more costly, tickets. (A friend got a 136 kph in a 130 and a 140 Euro fine.) You’ll note that I’ve said notices, because in each case we were notified by mail of the incident and fined 15 Euros. 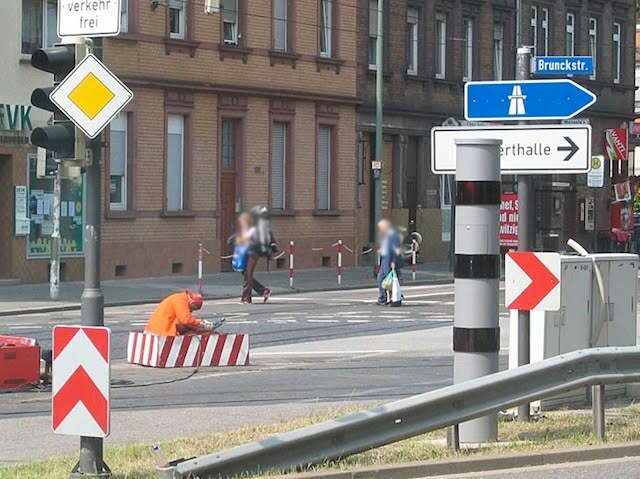 Typically, here in Germany, you’re notified by mail of a speeding incident because most tickets are now the result of being observed and photographed by an automatic, remote camera. The German police use a number of different types of cameras. They have permanently fixed cameras that may be placed in an actual speed limit sign, in a very nondescript gray cylinder or a simple box on a pole. They have portable cameras that they can quickly put up and take down so that they can place them at any location where they think there may be a speeding problem. The autobahns have these high tech speed limit and traffic advisory overhead signs. They can change the speed limit based on traffic and conditions. Some of these also have a speed camera conveniently placed inside. See that gray column with the dark stripes on the right. That's a permanently placed speed camera. They put them in between traffic directions so that it can photograph speeders no matter which way they're driving. Speed box on a stick. 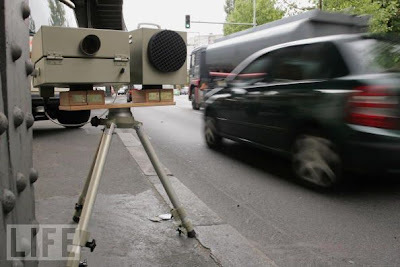 This is what the portable speed camera looks like but when the police put them out it's not placed this obvious. The portable camera is well hidden until the very last second. 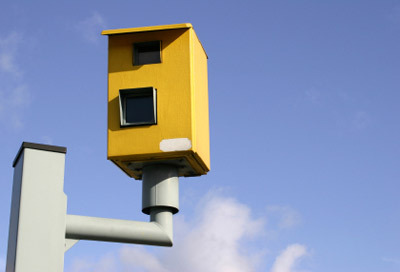 The Germans call being observed speeding by one of these cameras as getting “Flashed” because, as you pass, if you’re speeding, a very bright flash can be seen as your picture is taken. It’s so bright you have a pretty good idea that you just got caught. When you receive your speeding notice in the mail, in addition to your license plate number, there will also be a little fuzzy picture of you sitting there behind the wheel of your vehicle. That's not me in this picture but it shows just about what your picture looks like when you get your speeding notice. In some ways, Germans aren’t very different from Americans. They can get pretty angry about a speeding ticket too. Because these portable, remote cameras are place and leave devices, left completely unprotected, there have been a number of incidents after being flashed where a German driver became so incensed that they turned around, returned to the camera and proceeded to destroy it with a club or axe or setting it on fire. 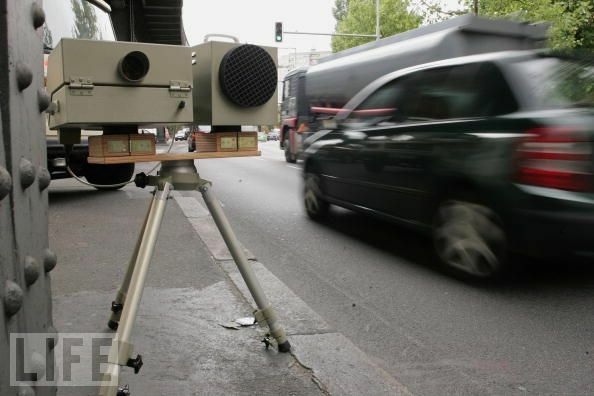 We think because of these speed cameras, most Germans are much more diligent about adhering to posted speed limits, especially if there’s a permanently placed camera that’s become well known to the local drivers. There’s a bridge over the Rhine River between Mainz and Wiesbaden that I’ve driven across hundreds of times to and from work. Twenty years ago the traffic flew across that bridge, ignoring the posted speed limit signs. Just a few weeks ago, driving across that same bridge, we noticed the traffic was moving along right at the posted speed, 80 kph, then, when passing a new speed limit sign, slowed to 60 kph as we approached the north side of the river. Sure enough, right there on the barrier between the two directions of traffic was the infamous nondescript gray cylinder. Well, I was just about done with this blog but guess what just showed up in the mail, speeding notice #4, 76kph in a 70. Again, just 4mph over the speed limit. 10 Euro fine. Just another case of the Deutscher man keeping us down. November 11, 2010, Veterans Day. Jeff and I drove to St. Avold, France to visit the Lorraine American Cemetery and Memorial, the largest U.S. Military cemetery in Europe. St. Avold is just across the French border from Saarbrucken, Germany, just an hour from our house. It was a windy, chilly day but, being there among the thousands of our fallen countrymen, was a warm, proud and humbling experience. Entrance to the Lorraine American Cemetery and Memorial. In St. Avold, France. There are 10,487 American servicemen buried on the 113 acres of Lorraine Cemetery. Among them are four Medal of Honor recipients, thirty sets of brothers and 151 unknowns. This French land was given to the United States in perpetuity as a gesture of thanks and a means to honor our courageous military men who fought for a cause much bigger than themselves and, in so doing, freed a continent. Most of the men buried there were killed in the last months of 1943 and early months of 1944, just a short time before World War II would come to an end, when they would have been going home. There was a short, unofficial ceremony in which the American Legion laid wreaths in the cemetery chapel. An American Legion pastor said a prayer, read the Presidents Veterans Day greetings and spoke a few words about the gallantry and sacrifice of the men that fought the evil and tyranny of Nazi Germany on the very soil where we stood. The rows of American heroes buried at Lorraine Cemetery. The cemetery memorial chapel is in the background. Our World War II servicemen were laid to rest facing west, and home. The grave of an unknown American. It was such an honor to be there with other Americans, mostly military personnel and their families, from the nearby bases in Germany. Nothing had been formally organized, they all had taken their own time to drive to France to pay their respects. A few American motorcycle clubs from Ramstein, Mannheim and Heidelberg made the cold ride to the cemetery too. Medal of Honor recipient, Andrew Miller. The grave stone of Medal of Honor winners are engraved in gold. An important note about Veterans Day. We are not the only country to honor our military members on November 11. On this same day, among the World War I allied members of Europe, whether it's called Remembrance Day or Armistice Day, they stop to pay respect to the millions of their best and brightest, an almost entire generation, who died in that first, great, brutal war of the 20th century. Click on these pictures to better read the engravings on the walls of the memorial chapel. The back, east wall of the chapel. The north wall of the chapel. A huge map depicting Allied operations across Europe on the south wall of the chapel. The front, west wall of the chapel. The figures here personify the eternal struggle for freedom. King David, Emperor Constantine, King Arthur and George Washington reinforce the youthful figure in the center. The wording on the west wall below the five figures. In addition to all the US military members, there are folks stationed here at Ramstein from most of the member NATO countries. Some of those member countries have such a large contingency of people that they require their own building, or at least a significant part of a building. Of course the Germans have a significant presence here and occupy a couple buildings. The Brits and the Canadians share a building. The Belgium military has their own small building. Just like the US military, these other NATO members like to bring a little bit of their own country to the assignment here in Germany. In the Brit/Canadian building there’s a small British store where they, and we, can buy an assortment of UK favorites, including liquor, tea and biscuits, meat pies and much more. On the second floor the Canadians have their own store too. Down the hall from the Brit store is a British cafe where you can get a typical English breakfast or lunch. Even though we’re smack dab in the middle of Germany, the Germans want a bit of Deutschland on Ramstein too. In the German complex there’s a great gasthaus, the Deutsches Haus Ramstein, where you can get all the schnitzel and German beer you desire at a price that can’t be beat. The Deutsches Haus is so popular that they’re expanding the facility. Each one of those places has its own unique atmosphere but probably the most fun of them all is the Belgium bar. Located in the back side of the Belgium building is the Belgium bar. Although it has opening hours each day of the work week, Tuesday and Thursday are the most popular evenings when the bar is open until 2200 (10PM). Thursday seems to be the most well attended night because it’s 50 cent beer night. On any given Thursday night you’ll see a wide cross section of ranks and countries. Of course, there will be folks from Belgium, Germany and the US but also Poles, French, Brits, Canucks, Dutch, Norwegians etc. There’ll be a three-star general, two-stripe airman and everything in-between. There’s a wide range of Belgium beers from the 50 cents a glass, light lager, Cristal, to a dark Leffe, Chimay and an assortment of the favorite Belgium fruit beers. You always know if the bar is open when you walk up to the building. Pretty obvious walking down the hall where the bar is located. One of the coolest things at the Belgium house is how they pour their beer from the tap. Once they have a full glass, with a big head of foam, they take this flat edged utensil and knock off the head by sliding this knife like object across the top of the glass. I think the only place I've ever seen this done is in the movies. It's certainly not something that's done anymore in the States. Just a cool little custom. A great, late Thursday afternoon trip is to stop in the English store for some tea bags, then a couple beers at the Belgium bar and finish up at the Deutsches Haus Ramstein for a great German meal. Hopping all over Europe right here at Ramstein. Lots of folks have been telling us how great Heidelberg is. What a great shopping plaza it has. How pretty it is. In spite of the fact that we had lived only an hour from the city during our last assignment in Germany, we’d never been to Heidelberg. So, we fixed that last weekend. Our town, Weilerbach, is in the Kaiserslautern area which lies in the high terrain about 20 miles from the western rim of the of the Rhine valley. Heidelberg straddles the Nekar River, which flows into the Rhine about ten miles northwest of the city. Heidelberg is located at the very eastern side of the Rhine valley at the foot of the Odenwald, a low mountain range, which actually comprises the eastern wall of the valley. Well, everything we’d heard was true. The altstadt (old city) part of Heidelberg was beautiful. The fall colors along the Neckar River made the Alte Brücke, (old bridge), Brücketor (bridge gate) and Schloss Heidelberger (Heidelberg Castel) even more magnificent. The shopping plaza, which stretches for over a half mile along the western end of Hauptstraße (Main Street) has wonderful shops, gasthauses, hotels, small food vendors and more. We parked near the Bismarckplatz at the western end of Hauptstraße and started our walk allow the shopping plaza. Although it was busy, the number of people still allowed an easy stroll along the street. We stopped and got a fresh, warm brezel and then sat in a great gasthaus which quite happily served Kloster Andechs Spezial Helles, a light, crispy lager beer. Since the street has a very slight rise, you can see a good distance down the shopping plaza and see the great number of people out enjoying the day, plus all the terrific, old structures that line both sides of the avenue. A Bismarck bust in Bismarckplatz. Jeff at our first stop. Jackpot!! Kloster Andechs. The eastern end of the market street is dominated by the Heiliggeistkirche (Church of the Holy Spirit) which commands the sky line in this part of the city. Interestingly, pretty much around the entire perimeter of the church, right at the foundation of the building, there are souvenir booths, small book stores and even tiny cafes. Just north of the Heiliggeistkirche, on the Nekar, is the Alt Brücke, a beautiful bridge spanning the river. On the south side of the bridge is the Brücketor, a unique gate that leads into the old city of Heidelberg. Alt Brücke (Old Bridge) over the Nekar River. During World War II, retreating German forces blew up three of the spans on the bridge. From the bridge, pass through the Brücketor (bridge gate) to enter the old city of Heidelberg. Not sure what the significance is of this strange brass monkey statue which is located at the base of the Brücketor. Just southeast of the Heiliggeistkirche, on the high ground above the city, known as the Königstuhl (king’s throne), is Heidelberger Schloss, a very large Renaissance castle ruin. Quite obviously, from the visible building styles, portions of the Schloss were built at various times over the centuries. We didn’t have time to visit the castle this trip but now that we’ve been to Heidelberg, we’ll be back. A week ago, Saturday, we drove to Idar-Oberstein to see the church in the rock. Like so many places we’ve been to laterly, Idar-Oberstein is just an hours drive from our home in Weilerbach. Idar-Oberstein lies deep in a the valley of the Nahe River which flow on to Binen where it joins the Rhine River. Friends in Weilerbach had told us about the church in the rock, which is called the Felsenkirche. The story behind the church is that a man had fallen from a high precipice onto a ledge and survived. Because he was able to live through his great fall he took it as a sign from God that he must build a church on the very spot where his fall came to an end. Because his landing point was essentially on the face of a cliff, he decided to carve his church out of the rock. The Felsenkirche was pretty easy to find once we got into the city. It does indeed sit on the face of rock cliff with two other castle ruins on nearby peaks. The church and the castle ruins are above the old town area which has a very nice shopping area. Most of the shops sell semi-precious jewels which Idar-Oberstein is famous and has long established the city as a gemstone center in Germany. Well, here it is. The Felsenkirche sitting high above altstadt (old city) Idar-Oberstein. A closer look of the Felsenkirche. We took the steep steps up to the Felsenkirche for a walk through of the church. Then we followed a paved but still precipitous path up to the highest caste ruin, the Schloss Oberstein. Schloss Oberstein high above the Felsenkirche. Felsenkirche above the shopping area of old town Idar-Oberstein. The tunnel stairways into Felsenkirche. The steep path up to Schloss Oberstein. Idar-Oberstein from high above at the Schloss Oberstein. Once we were back down to city level we were ready to eat. We stopped at a pretty, half-timbered hotel and gasthaus which advertised that they were the original source of a common dish called Spießbraten. Spießbraten is a marinated beef or pork that tastes great no matter who serves it and, as usual, we had another great German meal there in Idar-Oberstein. The drive home was interesting because we total relied on our GPS. It might have been the shortest distance but it certainly wasn’t the fastest since we ended up on some very narrow, very steep, very remote German country roads. But, it was fun and we passed through a good number of villages that we’d like to visit again. One final tidbit, Bruce Willis was born in Idar-Oberstein.